If only the Florida Department of Transportation was as concerned about traffic safety as one mysterious resident in Miami’s Belle Meade neighborhood. A traffic safety vigilante known only as “the cone fairy” has been making nightly visits to a dangerous street in this neighborhood and applying a simple, temporary solution to reckless speeding: orange cones in the center of the street. The very naughty Cone Fairy has done it again. Last night she mischievously placed 7 orange traffic cones down the center of NE 76 Street in an attempt to calm traffic to protect children, parents with strollers, cyclists and pets from speeding drivers. For the past 5 months my neighbors and I have been trying to get the city and county to do something about the reckless drivers that come barreling down our street everyday. Unfortunately, true to form, neither the county nor city has acknowledged that the fundamental problem with this road, as with the majority of our streets in South Florida, is the actual design of our roads that encourages speeding. It shouldn’t take five months to find a solution to this problem; this isn’t rocket science, it just requires a little common sense. It’s worth mentioning that all of Transit Miami’s recommendations to calm traffic on this street have been rebuffed by the county. In the meantime, cars continue to speed down my street and it’s just a matter of time before someone is struck by a speeding car. 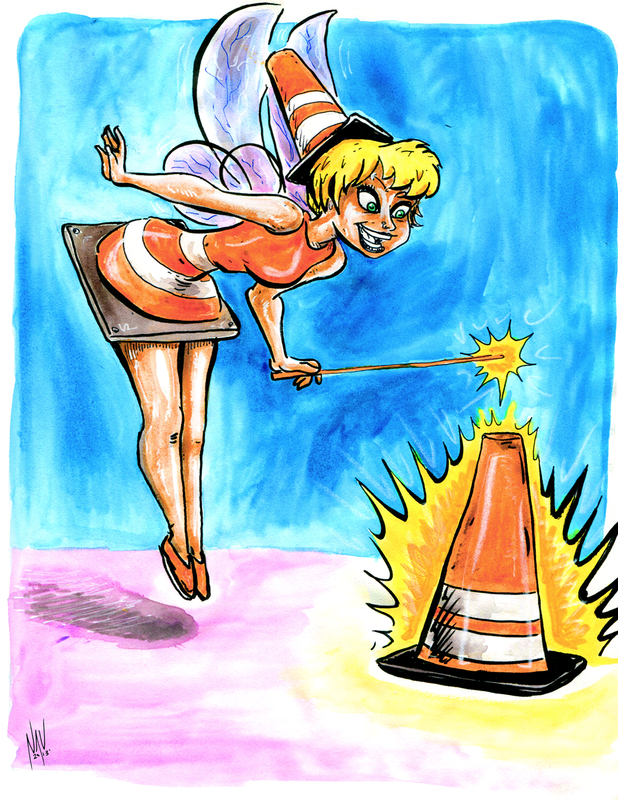 Look out, before you know it the Cone Fairy will be striping guerrilla crosswalks. Elsewhere on the Network today: Bike Delaware remarks on Rand Paul’s idea to cut all the national funding for biking and walking. Exit 133 says that Tacoma, Washington, is thinking about how it can improve safety in its school zones. And Stop and Move reports on the MBTA’s plans to enlist Boston-area college students to expand service hours. Bus riders got a dramatically faster ride thanks to a one-day pilot.